Hint: Click Log In in the top-of-the-page menu to go directly to the Virtual Branch® website. When you enroll with Virtual Branch® Services as a Bethlehem 1st FCU member, you can perform home banking tasks and communicate with the Credit Union quickly and easily from the comfort of your own home or wherever you may happen to be. These services provide secure access at any hour of the day. If you have any questions, help is at your fingertips. Virtual Branch® provides several resources including on-line interactive help, electronic messages to Member Services, or you can simply pick up the phone. Virtual Branch employs Multifactor Authentication. Click here to read more about Multifactor Authentication. Virtual Branch® is free to any Bethlehem 1st FCU member who qualifies and it’s easy to get started. 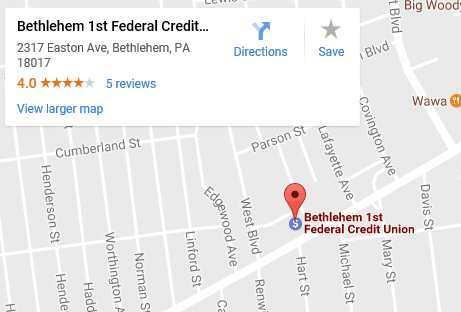 You must be a member of Bethlehem 1st Federal Credit Union to use Virtual Branch®. Click here for more information on eligibility and for a membership application. Enroll Online for Virtual Branch®. Click here for instructions on how to enroll online. Download and install the latest browser. If you do not already have a recent version of Internet Explorer, Google Chrome, Apple Safari, or Firefox, we recommend downloading and installing it now. All of these programs are free.